View on Utsunomiya, (宇都宮市), the capital of Tochigi Prefecture. The photographer most probably looked south-east from Futarayama Shrine (二荒山神社). Utsunomiya prospered as a temple town before it became a castle town and subsequently a town for accommodations along the Oshu Kaido highway, connecting Edo (current Tokyo) with Mutsu Province in the North, and the Nikko Kaido, which connected Edo with Nikko. 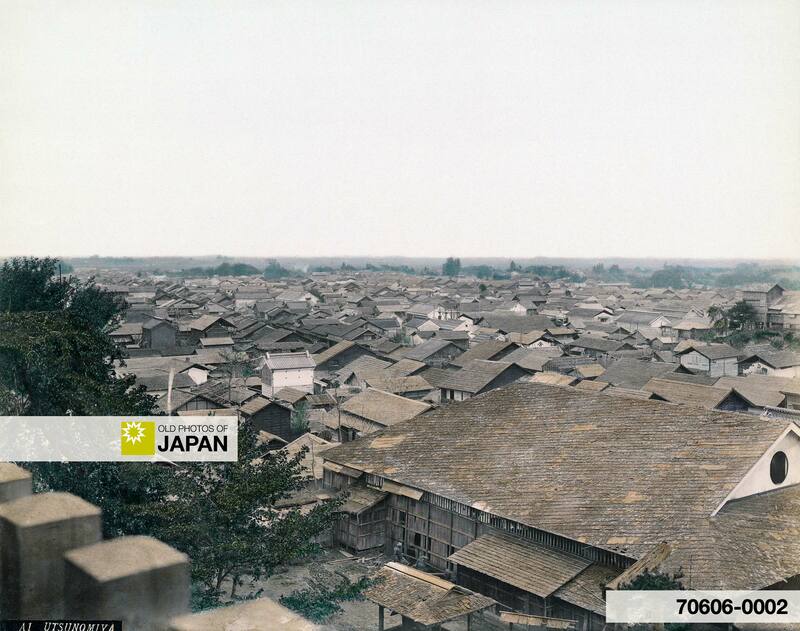 The town was destroyed during the Boshin War (a civil war fought from 1868 to 1869) and once again during WWII. As the majority of the photographs during the Meiji Period were created for sale to foreign visitors, this image of a town that didn’t attract that many of them is quite special. Early English language travel guides only mention the city as a station on the way to the very popular tourist attraction of Nikko. Notice the common usage of Shimotsuke, which is the name of the old province that became Tochigi Prefecture. Shimotsuke Province was abolished when the Japanese prefectural system was established in 1871 as part of the early reforms of the Meiji Period (1868-1912). 1 (1914) An Official Guide to Eastern Asia: Vol. III North-Eastern Japan. The Imperial Government Railways, 317. You can also licence this image online: 70606-0002 @ MeijiShowa.com.